This pattern was named by Larry Keig who, reporting in the June 2005 issue of the International Carnival Glass Association Carnival Pump, says that as it had not been shown or described in other Carnival Glass publications, he has named it Ten Panels. There are ten slightly concave panels pressed into the sides of the interior. There is no pattern on either the inside or outside base. 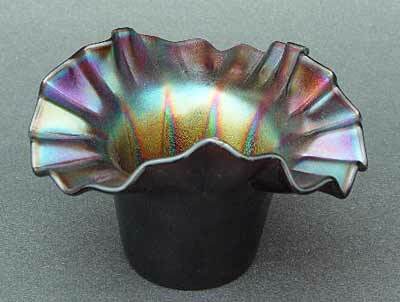 The exterior has no pattern and was not iridized in the three examples Larry has seen. 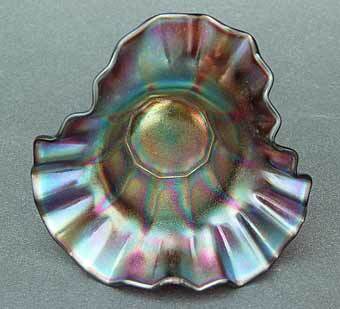 So far found only in amethyst, they are seen in six ruffled and the tricorner crimped version shown here. Thought to be Dugan, but no definitive proof exists. This piece sold on eBay in 2005 for $50.